We are in the process of updating the Comprehensive Plan. Visit the PlanCOS page for more info. The 2001 Comprehensive Plan is a guide for the physical growth of the city to the year 2020. In doing so, it serves as a long-range vision of what we want our city to become, as a tool for making decisions about how that vision should be achieved, and as a specific program of action for reaching our stated objectives. As a long-range vision, the Plan sets forth the values we want to realize as the city changes over the next 20 years and ties those values to the physical development and shaping of the community. It also presents an official policy framework and mapped context for making incremental decisions regarding land development issues. Finally, the Plan outlines the strategies and steps the community can follow to make it a reality. The Comprehensive Plan outlines information on land use, neighborhoods, transportation, community infrastructure, natural environment, community character and implementation along with various land use maps. An Annual Report on the Comprehensive Plan was done from 2004 through 2008 to monitor and evaluate the implementation of the Plan and to be used as a gauge to measure the extent to which the Plan is able to effectively guide land use decisions. Works proactively with other communities to create and maintain a high quality of life in the Pikes Peak Region. The City’s Comprehensive Plan provides an important foundation for the elements of the City Code pertaining to land use regulation. This Plan and its constituent elements function as a key advisory documents related to review and action on most discretionary land use applications. The last comprehensive update occurred in 2001 in conjunction with adoption of a new Intermodal Transportation Plan. The Comprehensive Plan is both map and policy-based with an annually-updated 2020 Land Use map being the primary graphic component. 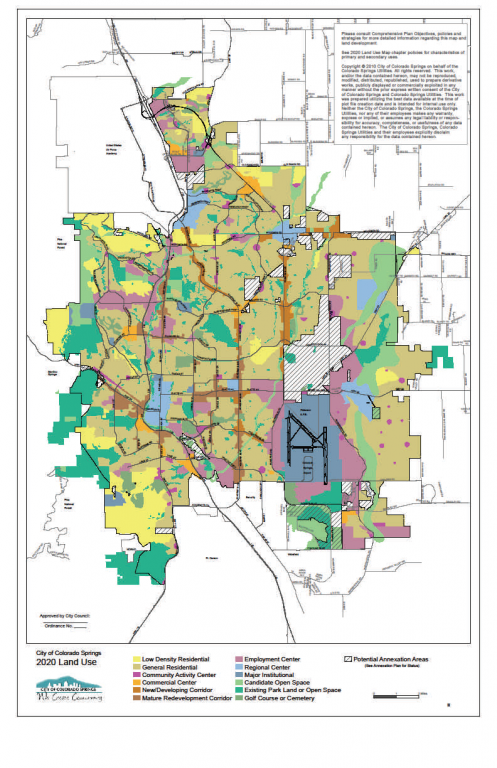 This map designates a general land use category for all properties within the City. The policies cover a wide variety of topical subjects with areas of emphasis including mixed use, support of neighborhoods and infill development. Each of these uses is defined in the Plan and a list of allowable uses is provided. In most cases these categories are relatively permissive. The Comprehensive Plan is also used to assist the City in its strategic objectives and investments, including establishing priorities for public investment. Periodically, new component plans are added, and existing component documents are updated or amended. Since 2001, approximately forty amendments have been approved for the Comprehensive Plan. A majority of these have been of a “housekeeping” nature, and involve updating the 2020 Land Use Map to reflect annexations and new or amended privately- initiated master plans. However, there have been several more substantial amendments including designation of new areas as Mature/Redevelopment Corridors, and the recent adoption of the Imagine Downtown Plan. The Comprehensive Plan includes an identified infill area which encompasses most of what was the developed area of the City as of the Year 2000. Many of the objectives of the Plan address this topic. Periodically, progress toward infill absorption is measured and reported.